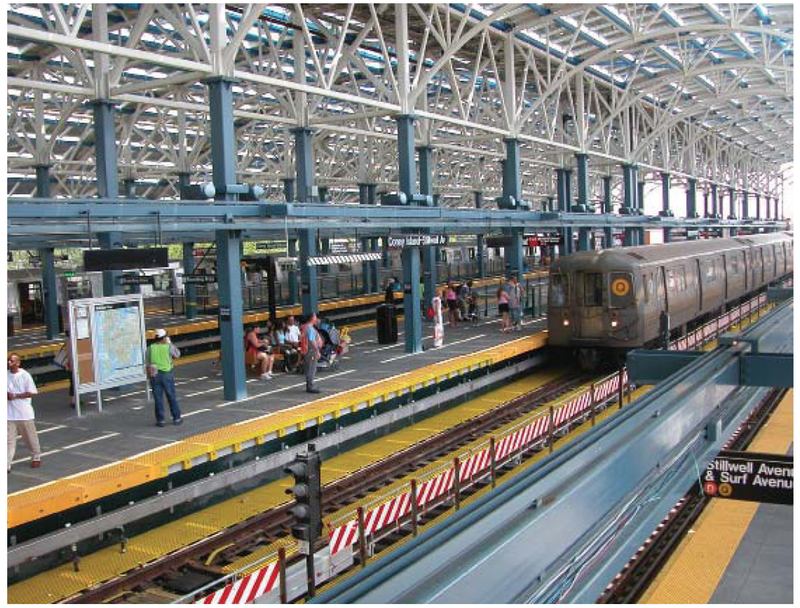 The Stillwell Terminal Train Shed is one of the largest building integrated photovoltaic arrays in the world, and was designed to meet the rigorous and detailed maintenance and operations requirements of New York City Transit, including security, durability, life-cycle, maintenance, and operations requirements. As a “first of its kind” project for New York City Transit, every feature of the design was subjected to detailed scrutiny by the Authority’s engineering and operations staff. The 80,000 square foot shed spans 4 platforms and 8 tracks at this busy terminal station, while providing approximately 250,000 kilowatt hours per year of clean electricity. A modular approach to the design of steel trusses and photovoltaic skylight panels allowed construction to proceed quickly, and the bulk of the work was completed between September 2002 and May 2004. This compressed schedule limited major service disruptions to one summer season. A light catcher in every sense of the word, each of the shed’s 2,730 identical panels admits a small amount of light to the platform, connecting passengers to the sky and the world around them.